Glioblastoma (GB) is the most aggressive type of primary brain tumor of the central nervous system (CNS). This Grade IV glioma comprises almost 80% of all malignant primary tumors of the brain, and 60% of all brain tumors in the adults. Several reports have suggested that radial glial cells in developing CNS are the progenitors for the neuronal and glial cells and they undergo continuous asymmetric cell divisions.,, Radial glial cells are mitotic and show neuroepithelial characteristics. It was initially believed that neurons do not divide in the adult brain, until the finding of Reynolds et al. came into light in 1996 where they showed that the epidermal growth factor (EGF) responsive, multipotent stem cell do exist in adult brain and they have the potential to survive in a dormant, nonproliferative state. Later, the development of refined methods for isolation and propagation of stem cells having properties of self-renewal and multilineage differentiation led to the successful generation of in vitro cultures of neural stem cells (NSCs) isolated from the,, dentate gyrus of hippocampus and subventricular zone in the adult brain. Radial glial cells also express an intermediate filament protein nestin which is also expressed in the NSC cultures. These studies support the hypothesis that radial glia act as NSCs. Moreover, most brain tumors including GB show glial nature and adult NSCs possess glial characteristics, suggesting that these tumors have the potential to arise from NSCs [Figure 1]. The discovery of glioma stem cells (GSCs) has added a new layer of complexity in understanding the pathogenesis of this heterogeneous tumor. In 2004, Berger et al. suggested that an asymmetric cell division occurring in cancer NSCs is one of the major mechanisms responsible for tumor growth and recurrence. By such mechanisms, a cancer stem cell divides to generate one cancer stem cell which maintains the constant stem cell pool in the clinically silent area (subependymal zone and neurogenesis zone) and one cancer progenitor that constitutes the expanding pool of tumor cells. These cancer progenitors migrate toward brain lesions. Malignant gliomas are invasive tumors and show extreme heterogeneity. Glioma was initially classified based on their presumed cell of origin into astrocytic tumors (astrocytoma, anaplastic astrocytoma, and GB), oligodendrogliomas, ependymomas, and mixed gliomas.,,, Later in 2007, the World Health Organization (WHO) classified glioma into four grades: Grade I (Pilocytic astrocytoma), Grade II (diffuse astrocytoma, well-differentiated oligodendrogliomas, and oligoastrocytomas), Grade III (anaplastic astrocytoma, anaplastic oligodendrogliomas, and anaplastic oligoastrocytomas), and Grade IV (GB) tumors. This grade-wise classification was based on histologic features and immunohistochemical similarity to putative cell of origin. The histological features studied were necrosis, mitotic activity, and vascular endothelial hyperplasia. Grade III and IV gliomas were termed as malignant or high-grade gliomas. Based on clinical characteristics and genetic differences, Grade IV GB was further classified into primary and secondary GB. Primary GBs arise de novo without any histological evidence of precursor lesions and are characterized by EGF receptor (EGFR) gene mutation and amplification, MDM2 overexpression, deletion of p16 and phosphatase and tensin homolog (PTEN), loss of heterozygosity (LOH) of chromosome 10q and telomerase reverse transcriptase (TERT) promoter mutation. Instead, secondary GBs arise slowly from preexisting lower-grade astrocytomas., The hallmark features of secondary GBs include p53 gene mutation, overexpression of platelet-derived growth factor A, and platelet-derived growth factor receptor alpha (PDGFRa), aberrant expression of retinoblastoma, LOH of 19q and mutations in IDH1/2, TP53 and ATRX genes. Later, a system for classification of GB into four subtypes (proneural, neural, classical, and mesenchymal) based on transcriptional features was proposed by Verhaak et al. in 2010. These subtypes differ in the genetic aberrations and clinical characteristics of the patients with respect to patient outcome upon treatment. A more stringent analysis of the transcriptomes of GB and non-GB tumor cells has led to the classification of GB into three subtypes, i.e., classical, proneural, and mesenchymal; as the neural subtype is believed to arise due to contamination of the original tumor sample with nontumor cells. Classical GB tumors represent abnormally high levels of EGFR and intact TP53 gene. EGFR activation keeps the cells in a proliferative state. Classical GB group is shown to survive the longest in response to treatment amongst other subgroups. On the contrary, proneural tumors are characterized by significantly mutated PDGFRA, TP53, and IDH1 gene, which altogether leads to uncontrolled tumor growth. Moreover, proneural patients are younger and tend to survive longer. Unfortunately, extensive treatment regimen does not significantly improve the patient survival as compared to patients that are not undergoing any treatment. The mesenchymal subgroup presents frequent mutations in the NF1, PTEN, and TP53 genes. Aggressive treatment regimen significantly increases the survival of patients falling under this subgroup. In addition, there are studies which show the existence of plasticity in GBM-subtypes. In 2017, an updated version of the WHO classification of gliomas has subdivided infiltrating gliomas of all histological grades into three broad groups based on two factors, i.e., deletion status of chromosomal arms 1p and 19q and mutational status of IDH1 and IDH2 genes. The three subgroups are (i) astrocytoma, IDH-mutant; (ii) astrocytoma, IDH-wild-type; and (iii) oligodendroglioma, IDH-mutant, and 1p/19q-codeleted. Studies indicate that IDH mutations are early events in the development of gliomas and mutations in either TP53 or 1p/19q co-deletions, are acquired later. Additionally, Turcan et al. showed that IDH1 mutations are sufficient to induce changes in genome-level methylation patterns. This methylation profile clustering further subdivides IDH-mutant astrocytomas into G-CIMP-low and G-CIMP-high astrocytomas. A study by Ceccarelli et al. suggested epigenome-based malignant transformation of lower-grade to higher grade gliomas and indicated that G-CIMP-high tumors may progress to a G-CIMP-low subtype, with stark differences in survival of the two groups. Similarly, de Souza et al. (2018) showed that G-CIMP-low tumors resembled IDH-wild-type primary GB and heterogeneity among G-CIMP-high tumors could be utilized to identify the risk of recurrence at early stages. All these studies suggest that the classification of GB tumors into respective grades and subtypes are based on marked differences in their mutational and transcriptional patterns and may aid in the personalized therapy targeting unique genetic changes. Moreover, knowledge of molecular alterations in G-CIMP may also be combined to allow us to confront GB progression and/or recurrence in a better manner. Biomarkers may be defined as any measurable diagnostic indicator of biologic or pathologic or pharmacologic process that may be used to assess the risk or presence of disease. Current means of glioma detection include conventional forms of neuroimaging techniques such as CT and magnetic resonance imaging (MRI). More refined pictures of tumor physiology and metabolism may be obtained by advanced molecular imaging such as MRI, positron emission tomography (PET), or by F-fluoro-ethyl-tyrosine-PET (2014). However, in several cases, patients undergoing treatment manifest ambiguous alterations on imaging. These could be mistaken as tumor growth or reoccurrence, which in fact could just represent treatment responses. Histopathological classification or grading of tumors based on tumor biopsy is also no longer a fool-proof way for reliable diagnosis. Hence, there is an urgent need to use minimally invasive circulation-derived biomarkers not only for monitoring of tumor growth and treatment responses but also to distinguish true progression from treatment-induced changes in tumor. Liquid biopsy provides for a less invasive method for tumor diagnosis as compared to traditional tissue biopsy. It enables the detection of circulation-derived biomarkers present in blood or cerebrospinal fluid. Sullivan et al. reported the presence of circulating brain tumor cells (CTCs) in the peripheral blood of GB patients. They used “negative-depletion” CTC-iChip to identify CTCs based on enrichment of CTCs from the blood and then stained them for a panel of GB specific markers which were not normally present in the blood cells. CTCs demonstrated EGFR gene amplification in cases where such amplifications also existed in the primary tumor. These CTCs showed enrichment of mesenchymal markers but rarely showed metastatic lesions, suggesting that they could cross the blood–brain barrier and gain access to the systemic circulation. Key mutations of glioma such as EGFRvIII or IDH1/2 or even alteration in miRNAs could be detected in circulation either as circulating DNA, proteins or tumor cells and could greatly aid the prognostication and diagnosis of GB [Figure 2]b. A study by Wang et al. demonstrated detection of cell-free tumor DNA in CSF of patients having tumors residing adjacent to a cisternal or ventricular spaces. Importantly, due to the presence of a low population of circulating tumor cells compounded with the problem of heterogeneity in GBM tumors, use of circulating tumor cells as biomarkers is not always feasible. Hence, extracellular vesicles (EVs) released in circulation may serve as better bio-markers for GB diagnosis. EVs contain signature DNA mutations, proteins, and microRNAs that can serve as promising glioma biomarkers while providing several added advantages. The composition of EVs reflects the tumor heterogeneity as they are secreted by all the cells constituting a tumor mass. Molecules enclosed in EVs are protected from rapid degradation while in circulation. Moreover, they can traverse and communicate at distant sites which is one of the effective tumor cell response to changes in micro-environment. The content of EVs such as proteins and nucleic acids correlate well with their cellular counterparts.,, The expression levels of these molecules are subjected to changes in patients undergoing drug treatment. One of the study by Muller et al. involving vaccination trial on glioma patients, showed promising results wherein exosomal mRNA levels of IL8, TGF beta and TIMP1 post vaccination positively correlated with immunological responses. Shao et al. showed that exosomal levels of O6-methylguanine DNA methyltransferase (MGMT) and APNG showed correlation with parental GB tumor. MGMT and APNG are DNA repair enzymes which determine TMZ treatment efficacy in patients, and its presence in EVs or exosomes suggests its role as dynamic biomarkers. All these studies suggest the possibility of using circulatory biomarkers as a detection tool for a subset of patients with primary GBs, especially where the location of tumor is relatively inaccessible. In addition, it will aid in determining the patient's response to therapy or possibility of a tumor relapse. However, there is still a requirement for improved protocol in the area of circulating tumor biomarkers such as quick sample preparation and testing of samples to decide on person-specific treatment. Large cohort studies are a key to make liquid biopsy a routine method for a follow-up study to track disease progression as well as to assay for treatment response. The current standard treatment for GB includes maximal surgical resection of tumor, followed by radiation therapy and/or chemotherapeutics. The histological heterogeneity of GB tumors contributes to the variable responses and outcome of therapies which finally makes it a difficult tumor to treat. Although chemotherapeutic agents such as temozolomide are routinely administered to GB patients, all the patients do not respond to them similarly. Only GB patients in whom the promoter of the MGMT gene is methylated,, shows a positive response to alkylating agents such as temozolomide. Thus, MGMT methylation can be harnessed as a biomarker to check therapy response as it seems to change under the effect of treatment. Furthermore, GSCs have been shown to express high levels of drug transporters leading to increased drug efflux, resulting in drug inefficacy [Figure 2]a.
GB microenvironment is immunologically deserted or immunosuppressive as it lacks effector immune cells. The prevailing factors in GB microenvironment such as hypoxia, acidosis, nutrient starvation significantly reduces T-cell survival and activity, leading to immunosuppression.,,, Soluble factors secreted by GB tumors induce chemotaxis and proliferation of immunosuppressive regulatory T-cells, thereby increasing their number and blocking the anti-tumor immunoreactivity., Hence, major focus is developing vaccines that target tumor neoantigens and combine this treatment with agents suppressing inhibitory signals present in the tumor microenvironment. In one of the T-cell-based therapies, interleukin- 13R2α-targeted chimeric antigen receptor T-cells were delivered to multifocal tumor sites where it showed superior anti-tumor efficacy as compared to intravenous administration. T-cells could also be activated by viral vector-based cytotoxic immunotherapies which could be combined with strategies inhibiting immune checkpoints.,, In another study by Reardon et al. (2015), EGFRvIII-positive recurrent GB patients were administered with an EGFRvIII-peptide vaccine plus bevacizumab, and they presented greater progression-free survival as well as higher response rates as compared to those who received placebo plus bevacizumab. Although these immune therapies have shown potential to benefit glioma patients, their effects have been minimal. Hence, there is a need to develop therapies that can convert immunosuppressive microenvironment to a nonconducive one for tumor growth. To achieve this, a number of novel therapeutic strategies and vaccines are being tested. GBs are highly infiltrative as they can also invade into normal brain tissues thereby making complete surgical resection of these tumors difficult. Several studies suggest that GSCs are resistant to conventional chemotherapy and radiotherapy and that this is one of the main causes behind treatment failure. Their enhanced ability to expel chemotherapeutic drugs such as temozolomide is responsible for imparting chemoresistance. Moreover, GSCs are shown to have high intrinsic DNA repair capacity as compared to nonstem tumor cells, and they can evade genotoxic stress and radiation-induced apoptosis [Figure 2]a. Huang et al. reported that GSCs might be sensitized to radiotherapy by activation of targeted DNA damage checkpoints. Reduction of Sirt1 or HSP90 expression may also cause radiosensitization of GSCs. One of the important hallmarks of GB is sustained tumor angiogenesis which imparts them an aggressive nature. GSCs express high levels of vascular endothelial growth factor which stimulate tumor angiogenesis, thereby making this tumor highly aggressive and causing tumor recurrence [Figure 1]. There are several reports which suggest that GSCs initiate gliomagenesis by activating Notch signalling pathway. By targeting Notch signalling, GSCs become sensitive to radiation and thus do not survive. Furthermore, GSCs are one of the important players contributing to the molecular and cellular heterogeneity of individual GB tumors. They have the potential to transdifferentiate into other lineage cells such as endothelial cells and pericytes and thereby promote tumor progression. Several reports indicate that GSCs arise from dedifferentiation of mature transformed cells. This transformation is bidirectional and occurs during tumor progression. It is also reported that CD133− glioma cells show shift toward transcriptional profiles resembling mesenchymal subtype on tumor recurrence while CD133+ cells express transcriptional profile representing proneural subtype. It suggests that CD133− GSCs are associated with more aggressive mesenchymal or proliferative gliomas., Because GSCs are involved in growth, recurrence and therapy resistance, they serve as attractive therapeutic targets for GB. NSCs represent a relatively small subpopulation located deep inside the adult brain. Hence, this makes procurement of these cells from the patients bearing tumors difficult for clinical use and challenging as a safe and effective personalized NSC therapy. Instead, the phenomena of transdifferentiation of skin fibroblast into iNSCs, first reported by Kim et al. 2011, makes iNSCs an attractive and effective therapeutic strategy for GB. These iNSCs can be engineered to express cancer-killing proteins that can activate prodrugs administered to patients, only in the tumor area. Hence, these cells possess the potential to resolve the problems faced by conventional chemotherapy and radiotherapy in terms of their specificity. Treatment of GB continues to be a clinical challenge despite a series of clinical investigations over several decades. The primary knowledge of glioma histopathology complimented with that of current molecular and genetic alterations have helped us in gaining a deeper insight into its complexity. Discovery of GSCs has further aided in understanding glioma development, therapy resistance, and recurrence. Several studies have identified and characterized signalling pathways and microenvironment that is responsible for maintaining these GSCs. Till date, several therapies such as anti-GSC therapy, anti-angiogenic therapies, immunotherapies, and targeted combination therapies have been tried in clinics, but none of them have yielded any significant improvement in prognosis. Hence, an urgent need for personalized therapy is warranted to develop specific treatments with less toxicity. Moreover, the lack of reliable diagnostic biomarkers is a major obstacle in the area of personalized medicine. Currently, the intensive focus is on the identification of clinical biomarkers and its validation to rapidly predict the disease prognosis. Circulatory biomarkers have emerged as a promising tool in the field of diagnostics. They offer a minimally invasive method for tumor diagnosis as compared to conventional tumor biopsy. With recent advancement in EV research, it is one of the most powerful tools for disease diagnosis as well as for determining treatment efficiency. However, the technical complexity and expertise required for EV isolation and analysis limits their translational utility in clinics. In addition, high costs of the chips utilized in analytical systems poses another hindrance. Recently developed immunomagnetic exosome RNA (iMER), a microfluidic platform integrates immunomagnetic enrichment of EVs from the tumors, isolates RNA from them and performs their detection using qPCR. In GB samples, GB-specific EVs are captured and enriched from serum samples by magnetic beads coated with antibodies against EGFR and EGFRvIII. EV proteins related to drug resistance may be detected by iMER platform which otherwise would be a challenging task due to their small amounts. With the development of integrated magnetic-electrochemical exosome platform, the rapid isolation and detection of EVs directly from clinical specimens is now possible. Several other nanotechnology-based platforms, such as nano-plasmonic exosome (nPLEX) systems, would also be of immense clinical utility because of their high sensitivity for EV detection in a high-throughput way from clinical samples. Such technologies would allow us in identifying the cell of origin by profiling multiple proteins in EVs simultaneously. They would also facilitate assessing the treatment response by analyzing tumor burden over time. An advanced version of nPLEX system called as new nanoplasmonic sensor (NPS) provides more robust analyses of EVs in clinical samples from very less volume of patient specimens. The NPS system is sensitive enough to detect multiple biomarkers in several clinical samples rapidly and with higher accuracy. Although several studies are in progress in the areas of prognostication, diagnosis, and therapy for GB, many are yet in their infancy, and a lot remains unexplored to step into the area of personalized therapy that can extend the survival of patients to a significant extent. Agnihotri S, Burrell KE, Wolf A, Jalali S, Hawkins C, Rutka JT, et al. Glioblastoma, a Brief Review of History, Molecular Genetics, Animal Models and Novel Therapeutic Strategies. Arch Immunol Ther Exp (Warsz) 2013;61:25-41. Messali A, Villacorta R, Hay JW. A Review of the Economic Burden of Glioblastoma and the Cost Effectiveness of Pharmacologic Treatments. Pharmacoeconomics 2014;32:1201-12. Rock K, Mcardle O, Forde P, Dunne M, Fitzpatrick D, O'Neill B, et al. A clinical review of treatment outcomes in glioblastoma multiforme—the validation in a non-trial population of the results of a randomised Phase III clinical trial: has a more radical approach improved survival? Br J Radiol. 2012;85:e729-33. Noctor SC, Flint AC, Weissman TA, Dammerman RS, Kriegstein AR. Neurons derived from radial glial cells establish radial units in neocortex. Nature 2001;409:714-20. Miyata T, Kawaguchi A, Okano H, Ogawa M. Asymmetric inheritance of radial glial fibers by cortical neurons. Neuron 2001;31:727-41. Noctor SC, Martínez-Cerdeño V, Ivic L, Kriegstein AR. Cortical neurons arise in symmetric and asymmetric division zones and migrate through specific phases. Nat Neurosci 2004;7:136-44. McKay RD. The origins of cellular diversity in the mammalian central nervous system. Cell 1989;58:815-21. Weiss S, Reynolds BA, Vescovi AL, Morshead C, Craig CG, van der Kooy D. Is there a neural stem cell in the mammalian forebrain?[comment]. Trends Neurosci. 1996. Gage FH, Ray J, Fisher LJ. Isolation, characterization, and use of stem cells from the CNS. Annu Rev Neurosci 1995;18:159-92. Weiss S, Reynolds BA, Vescovi AL, Morshead C, Craig CG, van der Kooy D, et al. Is there a neural stem cell in the mammalian forebrain? Trends Neurosci 1996;19:387-93. McKay R. Stem cells in the central nervous system. Science 1997;276:66-71. Gage FH. Neurogenesis in the adult brain. J Neurosci 2002;22:612-3. Alvarez-Buylla A, Garcia-Verdugo JM. Neurogenesis in adult subventricular zone. J Neurosci 2002;22:629-34. Berger F, Gay E, Pelletier L, Tropel P, Wion D. Development of gliomas: potential role of asymmetrical cell division of neural stem cells. Lancet Oncol. 2004;5:511-4. Holland EC. Glioblastoma multiforme: the terminator. Proc Natl Acad Sci U S A. 2000;97:6242-4. Maher EA, Furnari FB, Bachoo RM, Rowitch DH, Louis DN, Cavenee WK, et al. Malignant glioma: genetics and biology of a grave matter. Genes Dev 2001;15:1311-33. Schwartzbaum JA, Fisher JL, Aldape KD, Wrensch M. Epidemiology and molecular pathology of glioma. Nat Clin Pract Neurol 2006;2:494-503. Smith C, Ironside JW. Diagnosis and pathogenesis of gliomas. Curr Diagnostic Pathol. 2007;13:180-92. Watanabe T, Nobusawa S, Kleihues P, Ohgaki H. IDH1 mutations are early events in the development of astrocytomas and oligodendrogliomas. Am J Pathol 2009;174:1149-53. Turcan S, Rohle D, Goenka A, Walsh LA, Fang F, Yilmaz E, et al. IDH1 mutation is sufficient to establish the glioma hypermethylator phenotype. Nature 2012;483:479-83. Ceccarelli M, Barthel FP, Malta TM, Sabedot TS, Salama SR, Murray BA, et al. Molecular profiling reveals biologically discrete subsets and pathways of progression in diffuse glioma. Cell 2016;164:550-63.
de Souza CF, Sabedot TS, Malta TM, Stetson L, Morozova O, Sokolov A, et al. A Distinct DNA Methylation Shift in a Subset of Glioma CpG Island Methylator Phenotypes during Tumor Recurrence. Cell Rep 2018. Gutman S, Kessler LG. The US food and drug administration perspective on cancer biomarker development. Nat Rev Cancer 2006;6:565-71. Fink JR, Muzi M, Peck M, Krohn KA. Multimodality Brain Tumor Imaging: MR Imaging, PET, and PET/MR Imaging. J Nucl Med. 2015;56:1554-61. Sullivan JP, Nahed B V, Madden MW, Oliveira SM, Springer S, Bhere D, et al. Brain tumor cells in circulation are enriched for mesenchymal gene expression. Cancer Discov. 2014;4:1299-309. Huang TY, Piunti A, Lulla RR, Qi J, Horbinski CM, Tomita T, et al. Detection of histone H3 mutations in cerebrospinal fluid-derived tumor DNA from children with diffuse midline glioma. Acta Neuropathol Commun 2017;5:28. Wang Y, Springer S, Zhang M, McMahon KW, Kinde I, Dobbyn L, et al. Detection of tumor-derived DNA in cerebrospinal fluid of patients with primary tumors of the brain and spinal cord. Proc Natl Acad Sci U S A 2015;112:9704-9. Zhu L, Cheng G, Ye D, Nazeri A, Yue Y, Liu W, et al. Focused ultrasound-enabled brain tumor liquid biopsy. Sci Rep 2018;8:6553. Aryal M, Arvanitis CD, Alexander PM, McDannold N. Ultrasound-mediated blood-brain barrier disruption for targeted drug delivery in the central nervous system. Adv Drug Deliv Rev 2014;72:94-109. Burgess A, Shah K, Hough O, Hynynen K. Focused ultrasound-mediated drug delivery through the blood-brain barrier. Expert Rev Neurother 2015;15:477-91. Kucharzewska P, Belting M. Emerging roles of extracellular vesicles in the adaptive response of tumour cells to microenvironmental stress. J Extracell Vesicles 2013;2:20304. Shao H, Chung J, Balaj L, Charest A, Bigner DD, Carter BS, et al. Protein typing of circulating microvesicles allows real-time monitoring of glioblastoma therapy. Nat Med 2012;18:1835-40. Im H, Shao H, Park Y Il, Peterson VM, Castro CM, Weissleder R, et al. Label-free detection and molecular profiling of exosomes with a nano-plasmonic sensor. Nat Biotechnol 2014;32:490-5. Jeong S, Park J, Pathania D, Castro CM, Weissleder R, Lee H. Integrated Magneto-Electrochemical Sensor for Exosome Analysis. ACS Nano 2016;10:1802-9. Muller L, Muller-Haegele S, Mitsuhashi M, Gooding W, Okada H, Whiteside TL, et al. Exosomes isolated from plasma of glioma patients enrolled in a vaccination trial reflect antitumor immune activity and might predict survival. Oncoimmunology 2015;4:e1008347. Shao H, Chung J, Lee K, Balaj L, Min C, Carter BS, et al. Chip-based analysis of exosomal mRNA mediating drug resistance in glioblastoma. Nat Commun 2015;6:6999. Esteller M, Garcia-Foncillas J, Andion E, Goodman SN, Hidalgo OF, Vanaclocha V, et al. Inactivation of the DNA-repair gene MGMT and the clinical response of gliomas to alkylating agents. N Engl J Med 2000;343:1350-4. Hegi ME, Diserens AC, Gorlia T, Hamou MF, de Tribolet N, Weller M, et al. MGMT gene silencing and benefit from temozolomide in glioblastoma. N Engl J Med 2005;352:997-1003. Park CK, Kim JE, Kim JY, Song SW, Kim JW, Choi SH, et al. The changes in MGMT promoter methylation status in initial and recurrent glioblastomas. Transl Oncol 2012;5:393-7. Wei J, Wu A, Kong LY, Wang Y, Fuller G, Fokt I, et al. Hypoxia potentiates glioma-mediated immunosuppression. PLoS One 2011;6:e16195. Barsoum IB, Koti M, Siemens DR, Graham CH. Mechanisms of hypoxia-mediated immune escape in cancer. Cancer Res 2014;74:7185-90. Sukumar M, Roychoudhuri R, Restifo NP. Nutrient competition: A New axis of tumor immunosuppression. Cell 2015;162:1206-8. Pilon-Thomas S, Kodumudi KN, El-Kenawi AE, Russell S, Weber AM, Luddy K, et al. Neutralization of tumor acidity improves antitumor responses to immunotherapy. Cancer Res 2016;76:1381-90. Yue Q, Zhang X, Ye HX, Wang Y, Du ZG, Yao Y, et al. The prognostic value of foxp3+ tumor-infiltrating lymphocytes in patients with glioblastoma. J Neurooncol 2014;116:251-9. Sayour EJ, McLendon P, McLendon R, De Leon G, Reynolds R, Kresak J, et al. Increased proportion of foxP3+ regulatory T cells in tumor infiltrating lymphocytes is associated with tumor recurrence and reduced survival in patients with glioblastoma. Cancer Immunol Immunother 2015;64:419-27. Lim M, Xia Y, Bettegowda C, Weller M. Current state of immunoassay for glioblastoma. Nat Rev Clin Oncol 2018;15:422-42. Ribas A, Dummer R, Puzanov I, VanderWalde A, Andtbacka RH, Michielin O, et al. Oncolytic virotherapy promotes intratumoral T cell infiltration and improves anti-PD-1 immunotherapy. Cell 2017;170:1109-19.e10. Speranza MC, Passaro C, Ricklefs F, Kasai K, Klein SR, Nakashima H, et al. Preclinical investigation of combined gene-mediated cytotoxic immunotherapy and immune checkpoint blockade in glioblastoma. Neuro Oncol 2018;20:225-35. Reardon DA, Nabors LB, Mason WP, Perry JR, Shapiro W, Kavan P, et al. Phase I/randomized phase II study of afatinib, an irreversible ErbB family blocker, with or without protracted temozolomide in adults with recurrent glioblastoma. Neuro Oncol. 2014;17:430-9. doi:10.1093/neuonc/nou160. Huang Z, Cheng L, Guryanova OA, Wu Q, Bao S. Cancer stem cells in glioblastoma-molecular signaling and therapeutic targeting. Protein and Cell. 2010. Huang Z, Wu T, Liu AY, Ouyang G. Differentiation and transdifferentiation potentials of cancer stem cells. Oncotarget 2015;6:39550-63. Friedmann-Morvinski D. Glioblastoma heterogeneity and cancer cell plasticity. Crit Rev Oncog. 2014. Lottaz C, Beier D, Meyer K, Kumar P, Hermann A, Schwarz J, et al. Transcriptional profiles of CD133+ and CD133- glioblastoma-derived cancer stem cell lines suggest different cells of origin. Cancer Res 2010;70:2030-40. 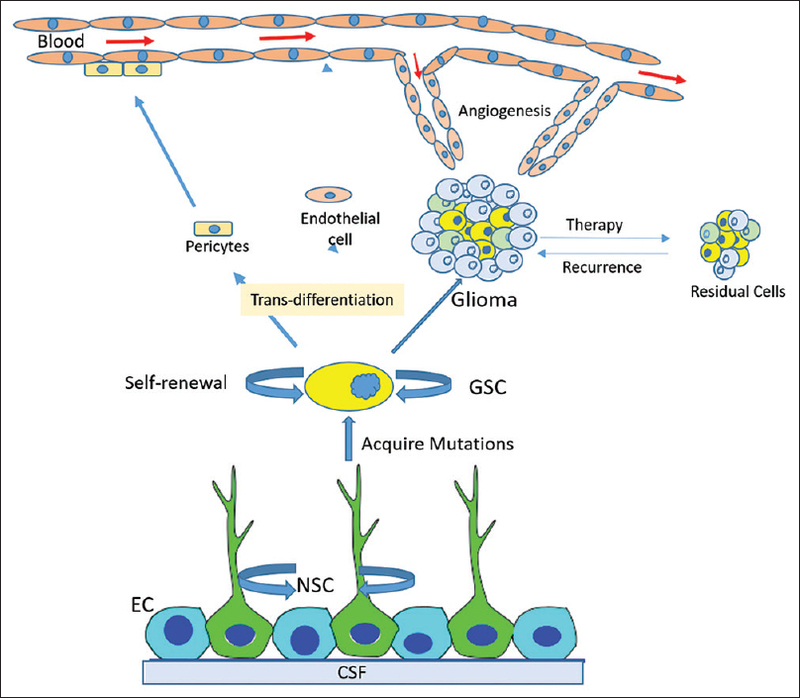 Huang Z, Cheng L, Guryanova OA, Wu Q, Bao S. Cancer stem cells in glioblastoma – Molecular signaling and therapeutic targeting. Protein Cell 2010;1:638-55. Herrlinger U, Woiciechowski C, Sena-Esteves M, Aboody KS, Jacobs AH, Rainov NG, et al. Neural precursor cells for delivery of replication-conditional HSV-1 vectors to intracerebral gliomas. Mol Ther 2000;1:347-57. Hingtgen SD, Kasmieh R, van de Water J, Weissleder R, Shah K. A novel molecule integrating therapeutic and diagnostic activities reveals multiple aspects of stem cell-based therapy. Stem Cells 2010;28:832-41. Ahmed AU, Alexiades NG, Lesniak MS. The use of neural stem cells in cancer gene therapy: Predicting the path to the clinic. Curr Opin Mol Ther 2010;12:546-52. Aboody K, Capela A, Niazi N, Stern JH, Temple S. Translating stem cell studies to the clinic for CNS repair: Current state of the art and the need for a rosetta stone. Neuron 2011;70:597-613. Aboody KS, Najbauer J, Metz MZ, D'Apuzzo M, Gutova M, Annala AJ, et al. Neural stem cell-mediated enzyme/prodrug therapy for glioma: Preclinical studies. Sci Transl Med 2013;5:184ra59. Kim J, Efe JA, Zhu S, Talantova M, Yuan X, Wang S, et al. Direct reprogramming of mouse fibroblasts to neural progenitors. Proc Natl Acad Sci U S A 2011;108:7838-43. Jeong S, Park J, Pathania D, Castro CM, Weissleder R, Lee H. Integrated Magneto-Electrochemical Sensor for Exosome Analysis. ACS Nano. 2016;10:1802-9. Yang KS, Im H, Hong S, Pergolini I, Del Castillo AF, Wang R, et al. Multiparametric plasma EV profiling facilitates diagnosis of pancreatic malignancy. Sci Transl Med 2017;9:eaal3226.